Astrophotographer John Drummond sent in his photo of Comet Lemmon taken on Jan. 23, 2013, in New Zealand. 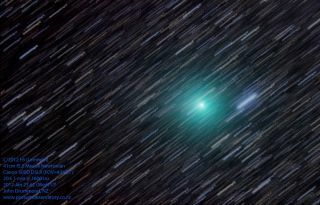 The dazzling Comet Lemmon has recently been taking center stage for those gazing up at the night sky south of the equator. Astrophotographer John Drummond took this photo on Jan. 23, 2013, from Gisborne, New Zealand. He used a 41cm f5.2 Meade Newtonian Telescope to view the comet and a Canon 500D DSLR camera, with settings at 20 x 1 min., FOV = ~43' x 27' to capture the image. "Over time it will head north and will be too far north for us New Zealanders to see it from about the end of May 2013." Comet Lemmon, or C/2012 F6 as it is officially known, was discovered by Alex Gibbs of the Mount Lemmon survey in Arizona in March 2012. At that time, it was very faint in the sky. However, the comet has made its way into the inner solar system and is getting brighter in the sky. It will be at its closest point to the sun, or perihelion, on March 24. Comet Lemmon is not the only comet in the night sky promising to dazzle stargazers this year. In March, the Comet C/2011 L4 (PANSTARRS) — sometimes referred to as Comet Pan-STARRS — is expected to brighten into a naked eye object that could make it a striking site in the sunset sky. Editor's note: If you have an amazing photo of comets Lemmon, Pan-STARRS or ISON that you'd like to share for a possible story or image gallery, please send images and comments to managing editor Tariq Malik at spacephotos@space.com.